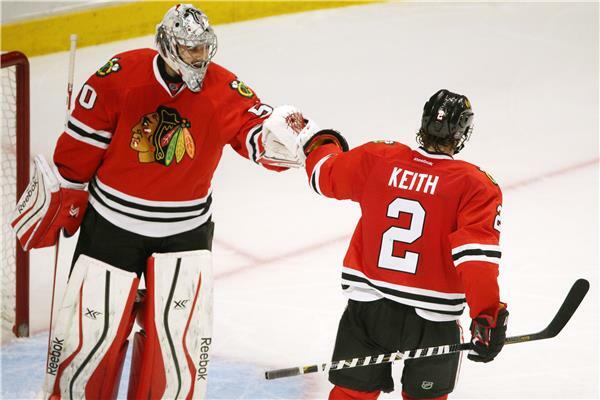 How you like Corey Crawford and Duncan Keith now? restaurant around 6 p.m., people flocked to take pictures of the man who just days ago grabbed himself on national TV. It’s been a hell of a playoff run so far for defenseman Duncan Keith. First he allegedly taunted Blues player David Backes by saying “wakey wakey,” then he records a goal and three assists in the game 6 victory. I saw Keith at a bar last year following the Stanley Cup Final. He appeared visibly annoyed by fans asking for pictures. Clearly, Duncan has no patience for the weak. Goalie Corey Crawford silenced the bleeping critics and won four straight. While we’re on the subject of completely irrelevant Blackhawks information, I’d like to highlight a tweet from yours truly about a fascinating dynamic at the United Center. What? I was just referring to their incredible ice shoveling skills. Earlier in the first- ound, Bears offensive lineman Kyle Long participated in the Shoot the Puck contest during an intermission between periods. Also this week, we learned Long might be spending way too much time with high school kids. I have no idea what could possibly be happening here. Maybe Kyle promised a few aspiring young minds that he’d lend them wheels? Also, what does it say about our society when a professional athlete has to go out of his way to let people know that he’s no longer aiding minors? In case you forgot, the Bulls are also in the playoffs, they’re just down 3-1 to the Wizards and severely overmatched. Bulls fans. Rock the UC Tuesday night. Series isn't over ! Hmmm, maybe Chuck heard that Derrick Rose was thinking about coming back for Game 5. Never mind. I don’t know if this is a brilliant metaphor for the Bulls postseason or if this person needs serious help. Car died. Phone dying. Lost In a field somewhere. Anyone wanna come find me I'll be walkin home. Wearing Chicago bulls gear. I joke because I’m sure “Wrecking Ball” made it home safely. Bulls forward Carlos Boozer made $16 million this season. He scored only eight points Sunday and hasn’t guarded anyone since he signed here as a free agent. And yet, inexplicably, Boozer stars in an NBA ad where he’s actually attempting to play defense. Well, at least it’s baseball season. The Cubs are 8-16.